The Pokemon Company will be releasing several Detective Pikachu tie-in products for the Pokemon Trading Card Game this April. The Pokemon TCG: Detective Pikachu products include four-card boosters with packaging based on the look of Ryme City from the movie. In all, 26 cards featuring Pokemon depicted in CGI-movie-likeness will be added to the game, and all cards are legal for Pokemon competitive events and in the online game. The first wave of products will be released on April 5. 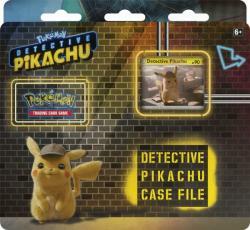 - Pokemon TCG: Detective Pikachu Case File includes a Detective Pikachu promo card, a metallic coin, two Detective Pikachu Booster Packs, and one additional Pokemon TCG Booster Pack. - Pokemon TCG: Detective Pikachu Charizard-GX Case File includes a one foil promo card and one foil oversize card featuring Charizard-GX, four Detective Pikachu Booster Packs, and two additional Pokemon TCG Booster Packs. - Pokemon TCG: Detective Pikachu Greninja-GX Case File includes a foil promo card and one foil oversize card fearing Greninja-GX, a pin with Greninja, five Detective Pickachu Booster Packs, and two additional Pokemon TCG Booster Packs. - Pokemon TCG: Detective Pikachu Collector Chest includes seven Detective Pikachu Booster Packs, two additional Pokemon TCG Booster Packs, a collector’s pin inspired by Detective Pikachu, and a Pokemon notepad and sticker sheet enclosed in a metal case.